In every society you have the elites and the rest. The percentage of people belonging to those two classes will fluctuate, and those broad categories are almost always broken down into further sub-categories, but in general, that’s how human societies tend to organize themselves. The Anglo-Saxons were no different. The elites were made up of the Kings, Earldomen, and to a lesser extent, the thegns and the clergy. These were the powerful people, the ones with wealth and prestige. They owned the most land, and had the political power. The movers and shakers, as it were. It’s impossible to say exactly how many there were at that time, but suffice to say that they were not the majority. The majority of the people were the lower classes, those who were called the ceorls. We would call these the peasants. The word ceorl is where we get our English word churl from, but that word has connotations that give us a false picture of this class of people in 7th century England. The ceorls were freemen who owned or rented land, or were the tradesmen who were the silversmiths, weavers, carpenters, etc. They would work the land cooperatively with their neighbours, often sharing the burden of planting and harvest. Which would mean they would live in close proximately to each other in order to accommodate this division of labour, and as well as for protection. Often there was a lord, such as a thegn, to whom the ceorls would give either rent and/or labour to in exchange for protection. The thegn would also call on these ceorls as a fighting force, or fyrd, when needed. That is the broad strokes. Looking more closely at the ceorls, you will discover that this class was further broken down into three sub-classes, divided up by how much land the ceorl owned and therefore how wealthy they were. The highest class amongst the ceorls was the geneatas. These were the peasant aristocracy, who owned the most land, sometimes as much or more as a thegn. They might not have to work the thegn‘s land in exchange for his protection, but they would have to pay some kind of rent or payment for his services. This could be in the form of food or livestock, not just money. They also could be messengers for the thegn, or help build fences around his lord’s land, or even provide entertainment. Below the geneatas were the kotsetla. They would provide labour on their lord’s land at least one day a week, and up to two or three days per week during harvest. The rest of the time they would work their own land. They could also do other work for the thegn, such as helping during the hunt or coast guarding duties. They could also be called up for duty in the fyrd. The gerburas were the lowest class of ceorl. They owned the least amount of land, or none at all, and in order to survive had to depend on their lord for land they needed to produce the crops and livestock to feed themselves and their families. In exchange they would work the lord’s land, at least two days a week, and more during planting and harvest. They would not have much free time to improve their lot, and would have been the ones with the hardest lives in Anglo-Saxon England (excluding the slaves, whom I will write about in a future post). It’s important to note that there was opportunity for movement between the classes. If one was born a gerbur, it didn’t mean you would necessarily be one for life, although, as I mentioned, the lower down you were the harder it was to move up. But in Anglo-Saxons society, hard work and service to your lord, whether that be militarily or otherwise, could be rewarded with gifts of land or booty from the latest military campaign, so it was definitely possible for people to improve their lot in life–if not for them, at least for their children. A hard-working ceorl who fought valiantly at his lord’s side could find himself rewarded generously in land, bumping him up the social scale. Subscribe to my newsletter to be kept up to date on my historical fantasy novel, Wilding. Publication date is inching closer! Click here to subscribe….it will arrive in your inbox generally once a month, but maybe more often as publication gets closer and I have more to report. Note: this is a fun post from a couple years ago. The blog is on hiatus this week but I’ll be back with fresh content next week. In the meantime I hope you enjoy this “wander” down memory lane…. Where is the spring and the harvest, and the tall corn growing? Who shall gather the smoke of the deadwood burning? One day I am going to do a longer post about Tolkien, the Anglo-Saxons, and Aragon in particular, but for today I wanted to give you just a little tidbit, illustrated by this poem. Ah, yes, Aragon, aka Strider, aka son of Arathorn, aka heir of Esildur, aka…well, stay tuned to the blog to find out! Tolkien, of course, was an Anglo-Saxon scholar, and in particular he modelled the Rohirrim after the people and culture of Anglo-Saxon Britain. the mercy of the Lord. Events must always go as they must! This poem can be found in the 10th century anthology of Anglo-Saxon poetry called the Exeter Book, but many scholars believe that this poem existed long before then in oral tradition, and could date back to the 6th century. Facsimile of the first page of The Wanderer from the Exeter Book (from Wikipedia). This looks like it is written like prose, not poetry, but if you look carefully you will see extra spaces between words, which is the indication of a half-line division of a line of poetry. Also you will see some dots between words, which is also meant to show other half-line breaks. The poem itself is about a warrior who is wandering in exile, having lost his liege lord, kin, and comrades in battle, defending his homeland from attack. It is melancholy in nature, which comes as no surprise – for in the Anglo-Saxon culture with its emphasis on close family ties and allegiance to a lord, to be alone in a strange land with no kin or lord to protect you is almost a fate worse than death. This is the Saxon concept of wyrd, the inexorable fate that binds every person, that cannot be denied. So the poem begins with both the Christian concept of God’s mercy and the Saxon idea of fate. And you will see these two world-views juxtaposed throughout the poem. It’s all a bit gloomy, I’ll admit, but I can imagine the effect of the scop singing or reciting this poem on the people gathered in the mead hall, snug against the winter storms, surrounded by their kin and secure in their own place in the world. It would have given both a sobering contemplation of the fate of the exiled stranger, and the delicious relief that they were not him. Kinda like the effect of a thunderstorm when you are in bed, you feel extra cozy knowing that you are not outside in the storm itself. The Wanderer ends with the counsel, “It is better for the one who seeks mercy, consolation from the father in the heavens, where, for us, all permanence rests.” The Christian world-view has obviously won out for the original writer of the poem. Of course there are other speculations that one could make, for example, that some scribe along the way altered the poem, adding more overtly Christian elements than were originally in there. It’s hard to say, and I guess we will probably never know. One of the best ways to understand a culture is to read their literature. Unfortunately, as the Anglo-Saxon culture was in many ways an oral culture, we have lost so much of their stories. I’m so glad this poem survived to open up to us the world of the mead-hall, and to enable us to meet the exiled wanderer, journeying alone through the icy mist. 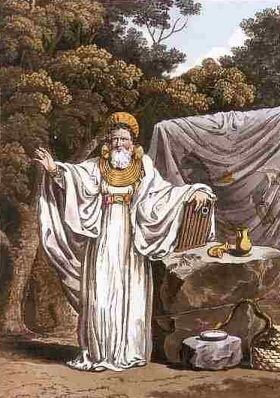 I took my translation of The Wanderer from Anglo-Saxons.net. Hop on over there if you want to see the whole poem in Anglo-Saxon along with the English translation. And just for fun, click here if you want to hear it read in the original Anglo-Saxon.